I've been experimenting with raw vegan food for almost 2 years now (thought my diet is not 100% raw vegan yet) and ever since I started I feel pretty good. Most important - I managed to handle some health issues that otherwise required medicine. But I am not going to ramble about the benefits of raw vegan diet today. 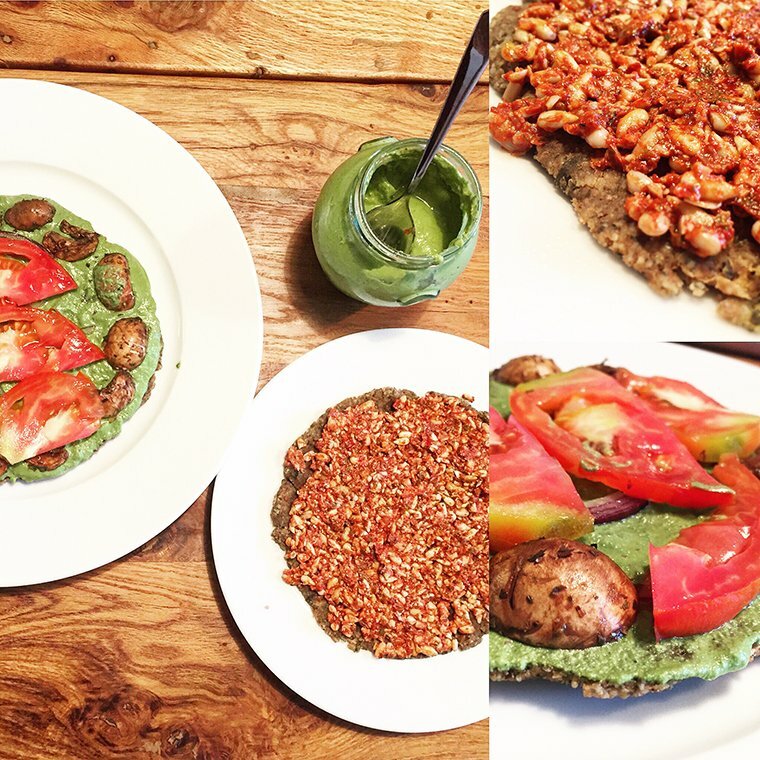 It's this quick and super easy recipe of raw vegan pizza that I want to share. Big disclaimer: The taste is not even remotely close to the taste of cooked pizza, but I do guarantee: it's so nutrient-dense that even though the pieces look very small, one is actually quite sufficient for a regular dinner or lunch. Also, I do not use any salt in my meals, but if you like salty taste, feel free to add to both the crust and the spinach pesto, the sunflower paste is definitely delicious without any salt added. Unfortunately, I don't remember all the ingredients for the sunflower seeds paste, but it definitely had pumpkin seeds, sunflower seeds (duh! ), pickled peppers, garlic, and some dried herbs - all blended. So, the ingredients and cooking instructions for 4 small servings. Blend all ingredients in a food processor until it sticks well. Divide the mixture into 4 pieces, shape them in your preferred crust shape with hands, and put them in your oven at the lowest temperature for about 2 hours or until crispy. Alternatively, you can use a dehydrator, but I don't have one, hence the over hack. I left the dehydrated crust to stay overnight on napkins to soak the oil from the seeds, but thats optional. I just wasn't hungry when they were ready. Put all ingredients in your food processor and mix until it reaches a creamy pesto consistency. That's it! I store it in a glass jar in the fridge. And pretty much any other veggie you want to add on top. I had my topping raw, except for the mushrooms which I marinated with a tiny bit or olive oil, vinegar and dried herb blend.